The month of July went quickly for us. First, everything needed to be ready for our next group from the States. Then we enjoyed the work and visit from the group from Oregon. 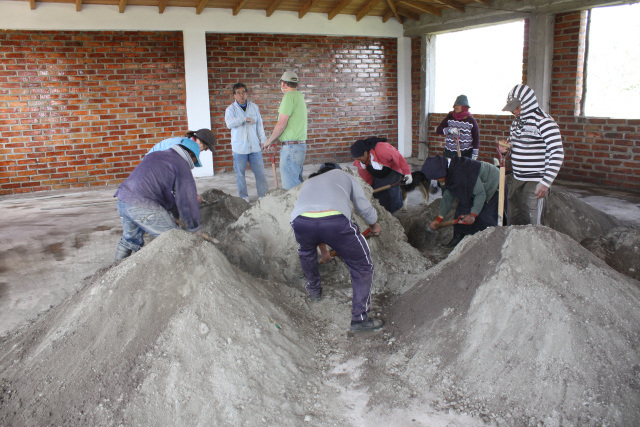 It probably does not sound like much to get ready for a group to come and volunteer to help a community help itself here in Ecuador. But it requires more work than you might think. A suitable project needs to be matched to the US group and the community must be readied. 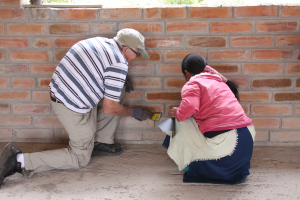 The community may need an advance of money in order to have the building ready to paint or lay tile or install windows or mix concrete. Is there a clean bathroom that the US group can use nearby? Will the community provide tea and crackers during a rest break in the morning? 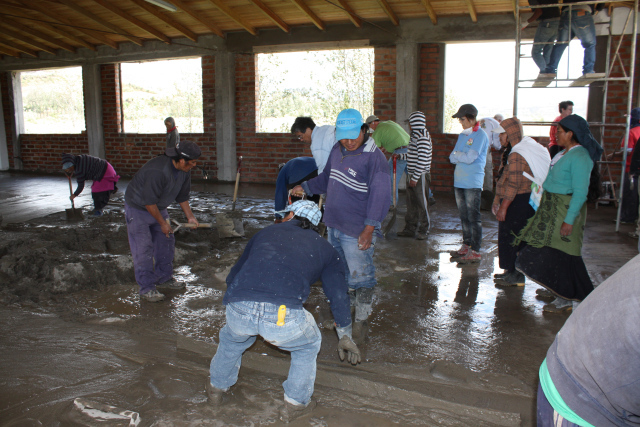 Will workers from the community be able to come help with the project during the week the group is working? Then, there is the planning for the group from the US. Reservations need to be made at a nearby, inexpensive hotel. Healthy meals need to be planned with the dining room. Will there be a space where evening meetings can take place? If the group will be here over one or two weekends, what touristic activities would they like to take part in? What restaurants will they eat at? A bus and driver needs to be hired. Bottled water needs to be purchased. And the afternoon before arrival, the rooms must be checked for towels and cleanliness; the 6 liter bottles of water and glasses from which to drink must be placed in each room; and finally, roses that are grown nearby must be purchased and placed in the rooms. (The roses are only a small extravagance: cost for 2 dozen is around $2 to $3 dollars in el mercado). And we must not forget about the activities the volunteers might bring. Will they provide a VBS for the children and youth of the community? Are there doctors or medical personnel that plan to bring a medical mission? Might someone give a workshop on self-esteem or healthy cooking? We must check with the community as to where these might be held. Who will be the community contact with the keys? Can the community provide publicity so people are prepared to come? How many of the US group speak Spanish? How many community participants might the US group expect to take part in various activities? Sounds like that is about it, right? Not quite. FEDICE staff must be readied as well. Who will translate at which meeting? Who is in charge of helping with the construction project? Who will help with the VBS? Who will stay and work with the medical mission? Do we have enough translators or must we hire more? Which staff will stay in the hotel and which will stay in the homes of nearby FEDICE staff or volunteers? We were ready to greet the Oregon group when they arrived at the airport around midnight. This is the normal arrival time for most groups. Then there is the 1 to 2 hour drive to the Hotel and the week of actual mission begins! All the work is well worth it. 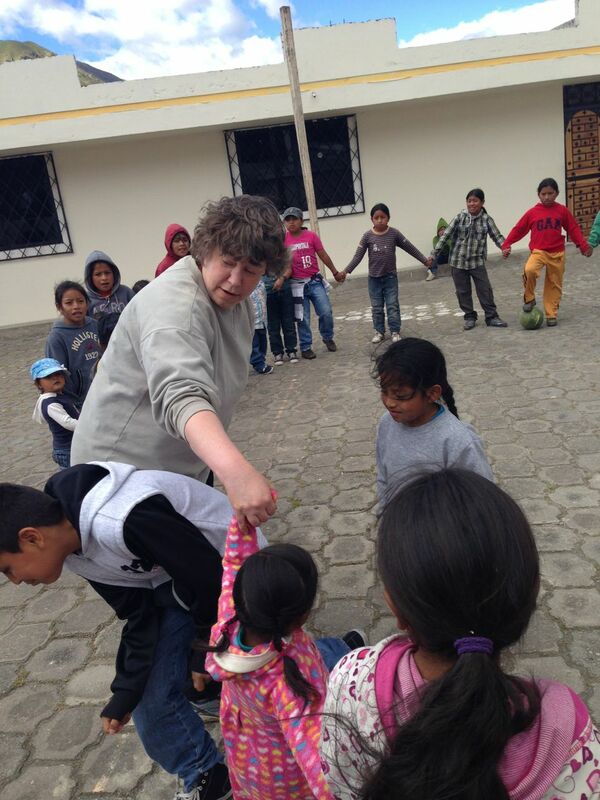 See Kelsey Hertel's Travel Blog for more pictures of grateful community workers, happy children, US volunteers who have made meaningful connections to people from this South American country of Ecuador. Expect a change and broader world view from both groups. The Oregon volunteers got to visit other projects they had provided for in the past. They got to see some beautiful scenery. But most importantly, they connected with people they only knew briefly, and shared the love of God with them. We are all one in the Spirit of God. That love transcends language, social status, faith practices, politics, and race. Thanks be to God. I really enjoyed myself from July 10th to July 20th, despite the work involved. Another group from the Christian Church (Disciples of Christ) Oregon and Southwest Idaho Region was here. I knew the majority of members from previous trips, so it was like seeing old friends. New friends were easily made, also. Watching and participating with the group reminded me why I’m always impressed with the way they approach mission work. For them, it’s not about the “work”, though there’s always plenty of that. It’s about connecting with people. It’s about respecting and getting to know a different culture without imposing one’s own values. It’s about smiles, handshakes, hugs, eating together, worshiping together, playing together, and praying together. It’s about struggling to learn a few phrases in Quechua to ease communication as well as affirm the basic equality of different cultures and countries. The group from Oregon and Southwest Idaho ultimately reaffirms that my presence in Ecuador is valuable. 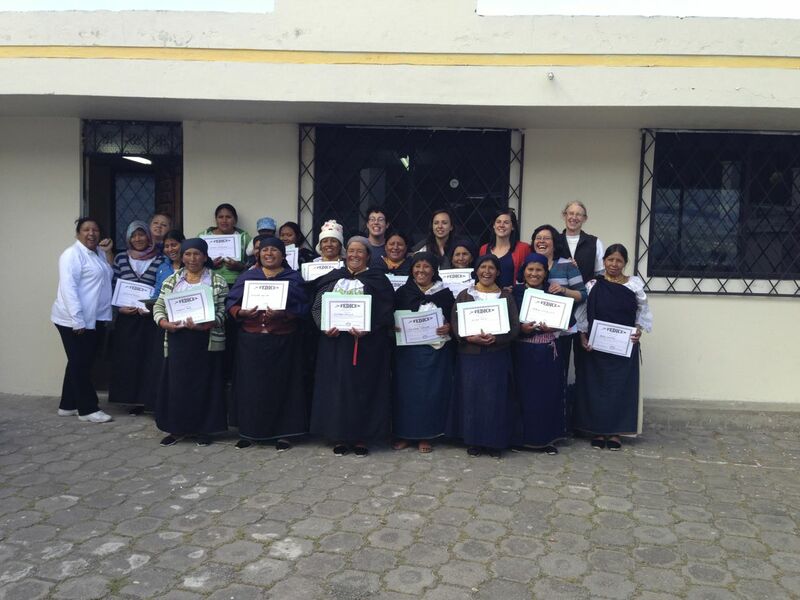 It was also wonderful to have such a caring group on hand to participate in FEDICE’s 20th Anniversary Celebration on July 19th in San Francisco, near Latacunga, Ecuador. It was a celebration of heart, mind, spirit, and foresight. It was a celebration of hours of tireless work on behalf of the economically marginalized people of Ecuador. It was a celebration of the numerous communities with which FEDICE works, with representatives from each community. It was a celebration of the vision of Victor and Violet Groth Vaca. 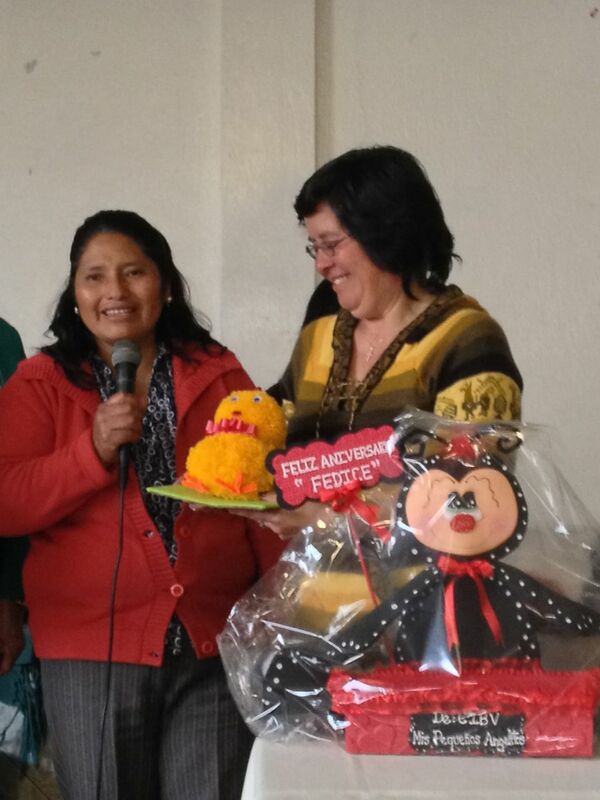 It was a celebration of the capability and dedication of the staff and volunteers of FEDICE, who are making sure that the vision of Violet and Victor is fulfilled in due course. It was a celebration of the future as well as the past. 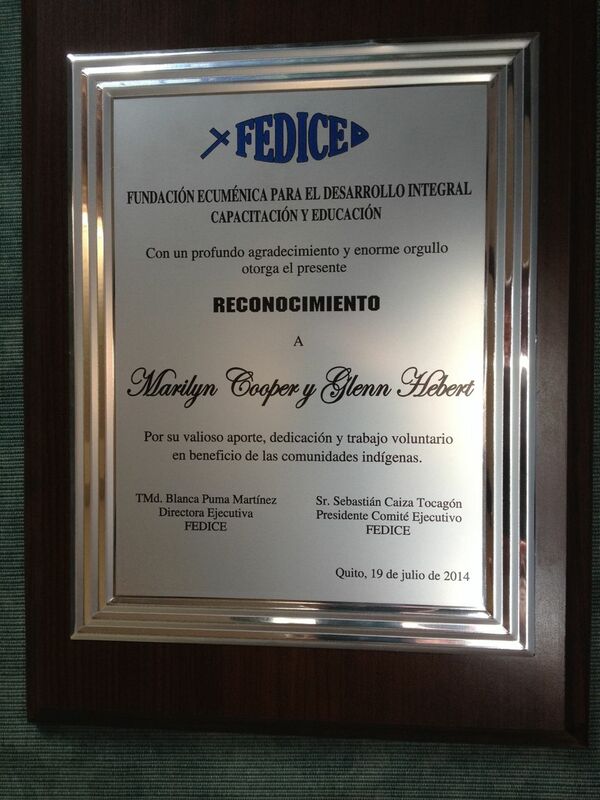 It was a celebration that made me feel honored to be volunteering with FEDICE through Global Ministries. 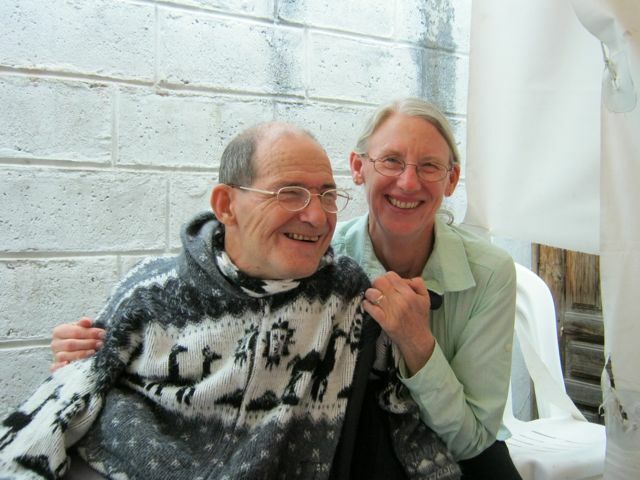 We were both told again on Friday what fine work we do for FEDICE in Ecuador. Both Marilyn and I have written before about wondering if we really make that much of a difference. It’s hard to explain why we wonder about this because it’s not due to a lack of confidence. Marilyn claims I have a huge ego (which I insist is merely self-esteem). But we do both view ourselves as ordinary. Fine work? We don't feel like we work that hard. In fact, I often feel slightly guilty for not putting up more blog posts, especially about FEDICE. I retired 10 years ago because I DIDN'T want to work hard any longer. We feel like we're just enjoying our lives. But the compliments keep coming. It's enough to make heads swell. We do do volunteer work for FEDICE, sometimes lots of work. Still, it almost feels as if we do it in our spare time because our work with FEDICE is usually in a fun atmosphere. Blanca and the staff see to that. Marilyn enjoys teaching English to preschoolers. At two and three years old, it's more like exposing them to the sounds of English pronunciation. The hope is that they'll enjoy it more when they study English in school later. During a group’s free time from working on a project with people in this area, Marilyn guides them to touristic sites. Both Marilyn and I welcome people to our home and try to help them feel comfortable. I work to improve FEDICE's presence on the web because it is an organization well worth knowing about. The fact that we in FEDICE work with people to improve their economic and social well-being in ways that they themselves want is special. Wait. The fact that communities have become economically self-sufficient and socially cohesive through the loans, training, and education provided by FEDICE is what is truly special. But, in all honesty, I do my part of this work "between" the selfish things I want to do, like writing this blog, reading, and watching fútbol americano. I also realize that I am a role model for the capabilities of persons with disabilities. A few years ago, Ecuador's vice-president was in an accident and became physically disabled. Since then, attitudes have begun to shift. The government has undertaken initiatives to improve accessibility and hasten the change from negative attitudes towards people with disabilities to positive attitudes. Ecuador feels like the U.S. did about 40 years ago, when I was part of a burgeoning movement for the rights of people with disabilities. I'm not politically active, but I hope that seeing me do things that disabled people are not “supposed” to do causes people to think about their preconceptions. Sometimes it does, as in the case of those who decide they want to get to know me better. Sometimes it doesn't, as in the case when, two weeks ago, the hot spring-fed pool rapidly emptied when I entered it. No matter their reaction to me, I try to always smile at strangers. Most of the time, I say, "Hola" or "Buenos días" as well. Again, however, this is not "work", volunteer or otherwise. It's simply the way I have chosen, and been fortunate enough, to live my life. At breakfast the other day, Marilyn and I were telling Bethany, Kelsey, and Aaron about the birth accident that caused me to have cerebral palsy. (These are three young people staying with us for varying lengths of time while volunteering with FEDICE.) Marilyn commented that I was normal before that accident. I playfully shot back, "I'm still normal!" Bethany assured us that I wasn't normal - I was extraordinary. Extraordinary? Because I try to live my life the best I know how, and because I try to have as much fun as I can? Really? Okay, if you say so. I'm not going to contradict people who say Marilyn and I do fine work in Ecuador. I'm not going to contradict people who tell me I'm extraordinary. We'll just soak it up. We’ll gladly and gracefully accept such comments in the spirit in which they are intended. And we’ll continue to wonder at the mystery of why these compliments are bestowed upon ordinary people like us.